A mail box post is covered with water south of downtown Kent on Wednesday morning. KENT — Nearly four miles of road along Route 7 were reopened late last week after being closed to traffic once again because of rising water levels on the Housatonic River. The ice dam on the river, which formed nearly two weeks ago, is forecast to stick around for about a month. After an unusually busy weekend in mid-January, local businesses are considering how to capitalize on Kent’s cold moment in the sun. Anne McAndrew, owner of Annie Bananie Ice Cream on Bridge Street, said she saw more than 100 people come through her ice cream parlor and gift shop on a recent Sunday. Dill said business slows when Route 7 — the town’s main thoroughfare — is closed due to flooding, but if weekend traffic picks up like it did recently, the dam could prove profitable. Meanwhile, the town of some 3,000 people has drawn plenty of news attention, First Selectman Bruce Adams said. Local television stations have broadcast several updates since the dam formed more than two weeks ago, and Kent even had popular meteorologist Jim Cantore, of the Weather Channel, who has 1.1 million followers on Twitter, broadcast from the river bank. 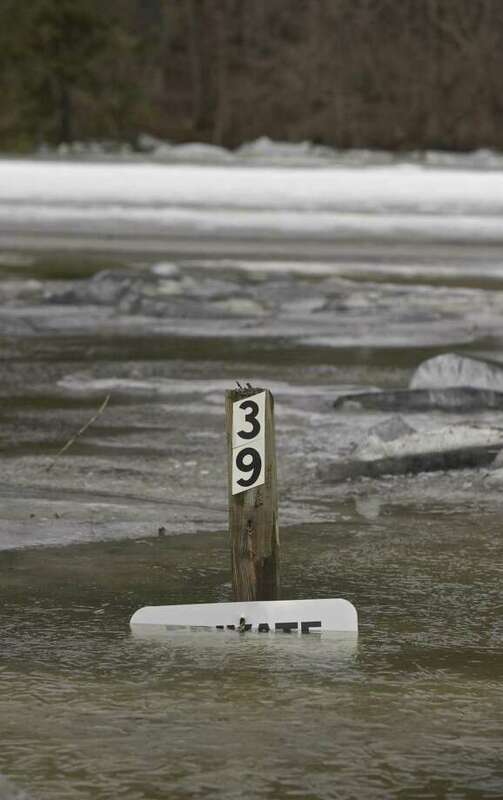 “It looks like we’re going to be stuck with the ice jam for a month,” Ohler said. The dam, while showing no signs of movement at its core, has shifted around the edges, Ohler said. Within two days last week it doubled in length to two miles, and then shed some 1,300 feet of ice on its northern edge, Ohler said. Authorities still plan to “let Mother Nature take her course,” and dynamite and wrecking balls, while speculated about, are not an option.